Showing 36 articles from August 29, 2018. LOUISBURG -- The Louisburg Police Department arrested 15 people and leveled 120 charges as part of an effort to root out drug activity. Operation Safeguard was an eight-month operation that focused on illegal drug distribution in and around Louisburg, said Chief Jason Abbott. 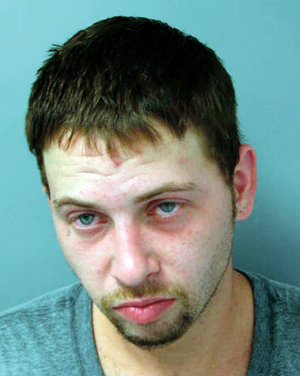 The town combined their efforts with Franklinton police and sheriff's deputies, Abbott said. FRANKLINTON -- A week after firing their town manager and accepting the resignation of the town attorney, Franklinton officials were not a step closer to choosing a replacement. Following an unscheduled closed session during the board's Aug. 21 meeting, commissioners by majority vote terminated the employment of Town Manager Tammy Ray. Hitting the right notes ... ! LOUISBURG -- Perhaps there should have been a John Philip Sousa march playing softly in the background -- if a Sousa march can be played softly -- when veteran music teacher, band director and musician Brian Miller received the Elizabeth May Service Award last week. 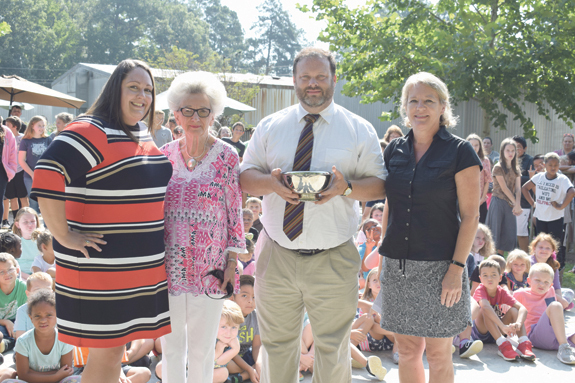 He received the honor -- and the engraved silver bowl that goes with it -- in front of the entire student body of Crosscreek Charter School where he is both a teacher and band director. FRANKLINTON -- Commissioners, the community and state rural planning center staff met last week to begin drafting an economic development strategic plan for Franklinton. During a June work session to discuss preparing for growth and development, commissioners agreed that community planners with NC Main Street & Rural Planning Center -- a division of the State Department of Commerce -- would host a series of community meetings designed to craft a 5-year strategic plan for economic development. 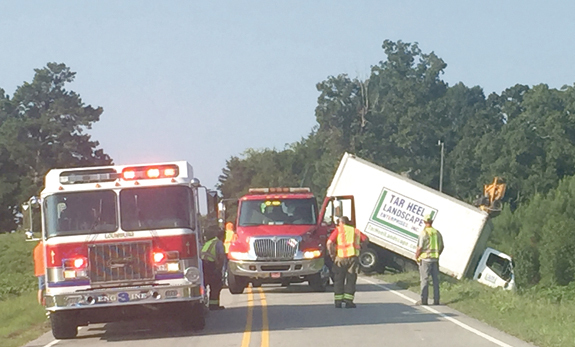 An Oxford man was cited for running a stop sign and hitting a landscaping vehicle, causing the box truck to tumble over onto its side. Only minor injuries were reported during the Monday wreck that rerouted traffic on U.S. 401 at E.F. Cottrell Road for a few hours during the morning commute. 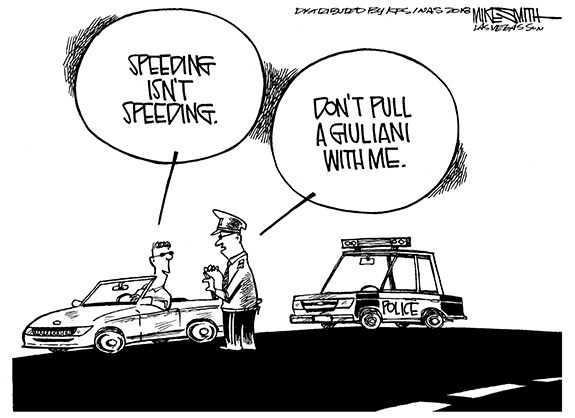 According to Trooper P.L. Clayton, Derrick Wells, 27, was traveling east on E.F. Cottrell when authorities allege he ran the stop sign and clipped the back of the truck, which was heading south on U.S. 401. Here's an amendment that addresses a need! Here's an idea inspired by local politics and furthered by reading six of the very worst, politically motivated, unnecessary and poorly worded Constitutional amendment proposals in the history of America! We'll get to those six embarrassments one of these days if our beloved General Assembly ever gets them ready for public consideration. In the meantime, I have an idea. This week, Americans have been saying farewell to a hero who served this nation with honor, sacrifice and love for many decades and whose straight talk and often-blunt humor made him a legend. Arizona Republican Sen. John S. McCain died last weekend after a 13-month battle with brain cancer. 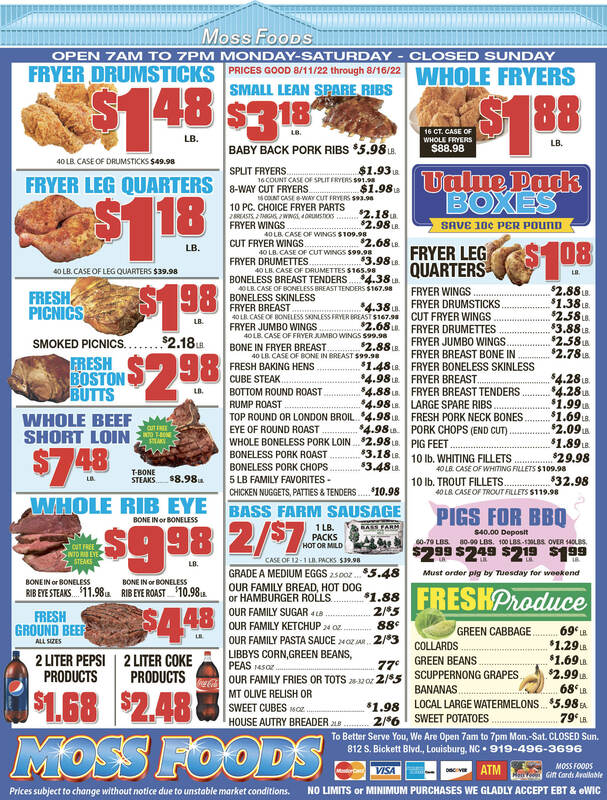 When I was a cub reporter, first as an intern at Florida Today in Melbourne, Fla., then at my first gig at The Sun Journal in New Bern, I heard all the tips and tricks of the trade. And, no, I'm not just talking about the important things like double check your sources, make sure you spell people's names right and, then, triple check your sources. I write today to express my utter disbelief in what transpired at the Franklinton Board of Commissioners meeting on Tuesday, Aug. 21. With no warning, no placement of an item on the board's meeting agenda, and in what was clearly a pre-orchestrated move, the board terminated Town Manager Tammy Ray. I just read the article "Opiod War: 'Any Weapon' is worth trying." Sheriff Kent Winstead states that in 2016 there were two heroin/opioid related deaths in Franklin County a week. This is a sad story, people losing their lives. Thank you for opening our eyes. RALEIGH--Betty Jean Freeman Matthews was born on February 10, 1931 in Greensboro, N.C., the daughter of Roland Shufford Freeman and Annie Mae Combs Freeman. She was a graduate of Greensboro High School. FRANKLINTON--E D Wood, 78, of Franklinton died August 28, 2018 at his home. He was born on October 3, 1939 to the late Ernest and Betty Collins Wood. Jan M. Spinks, 83, of Montpelier, Vermont, passed away peacefully at her home on Wednesday, August 1, 2018. She was born on July 2, 1935, in Joplin, Missouri to Milton and Jean Beger. LOUISBURG - Larry E. Tetterton, 82, of Louisburg, died Tuesday evening, Aug. 28, 2018. Arrangements will be announced by Strickland Funeral Home & Crematory, Louisburg. 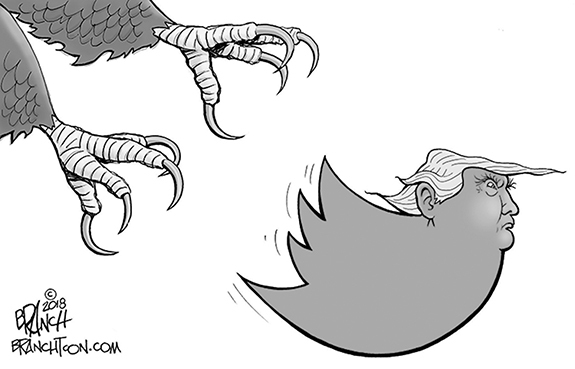 NET TEST. Louisburg High School's Dana Potter (right) attempts a kill over Franklinton's Amari Champion during Tuesday's volleyball match. FRANKLINTON - Two powerhouse teams, one much-anticipated air of intensity. Such was the theme for Tuesday's first meeting of the season between Franklin County volleyball titans Louisburg and Franklinton at the FHS Gymnasium. Both clubs won regular season titles in their respective leagues, and a lengthy fabric runs between the programs going back three decades. CORNELL IN THE CLUTCH. Franklinton High School quarterback Kenny Cornell scrambles for yardage for the Red Rams during last Friday's road decision against the Bunn Wildcats. UP IN THE AIR. 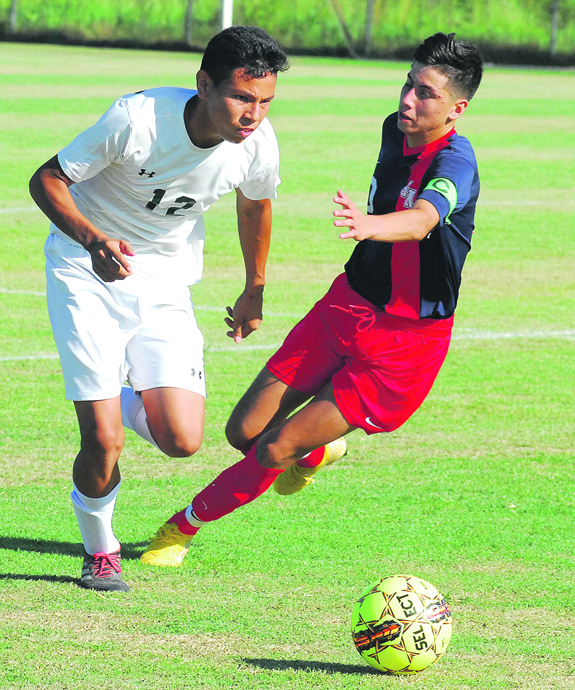 (L to R) Bunn's John Garcia and Southern Nash's Ezikiel Gonzalez try to possess a loose ball during last Thursday's soccer matchup. STANHOPE -- It took all of 23 seconds for the Southern Nash Firebirds to take charge of last Thursday afternoon's non-conference boys soccer meeting with backyard rival Bunn. BHS took the opening kick and passed the ball back, but an immediate turnover resulted in a Firebirds' rush up the right side. PLAYING CATCH UP. Louisburg's Aldo Jennings (left) tries to chase down Bartlett-Yancey quarterback Chase Johnson during last Friday night's football meeting. 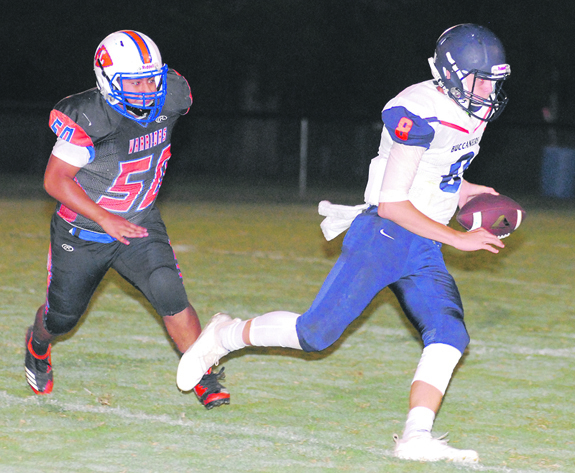 LOUISBURG -- After opening the campaign with a home victory, Louisburg hoped to continue its winning streak last Friday night when the Warriors hosted Bartlett-Yancey. DOWN IT GOES. 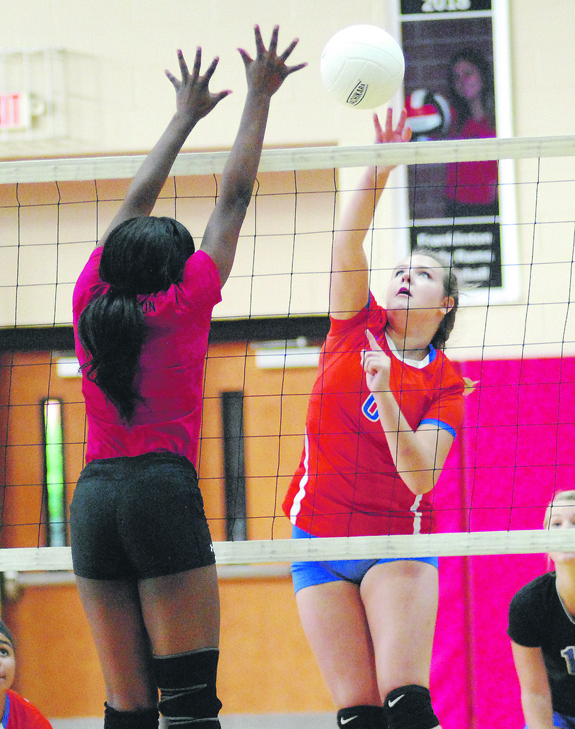 Franklinton's Britney Davis delivers a kill during Monday's road spike win at Bunn. 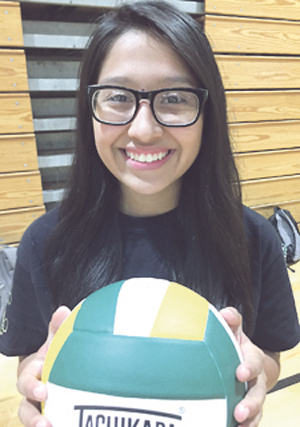 FRANKLINTON -- Hustle, passion, athleticism, quick passing and hitter explosion off the floor have become hallmarks of Crystal Barnes' second go-round as the head coach of the Franklinton High School volleyball program. 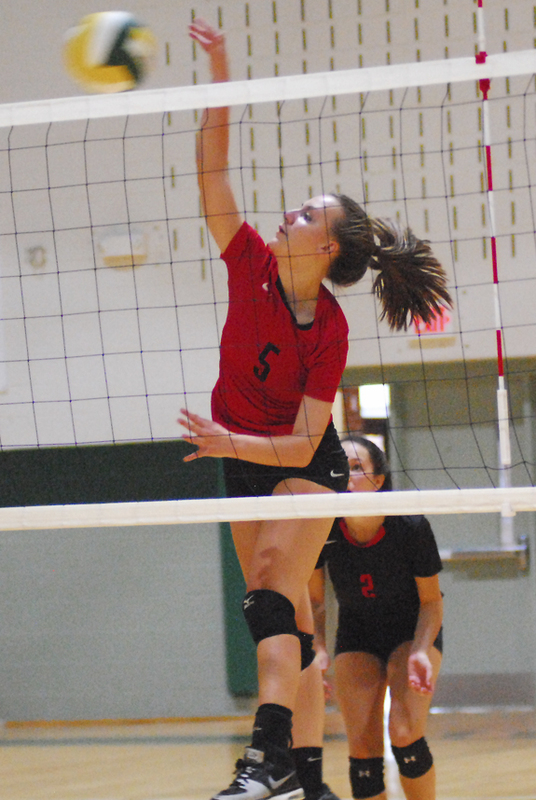 All of those intangibles were on display on a grand stage Monday as the Lady Rams secured an impressive three-set road sweep at rival Bunn. ZEBULON -- Christian Taugner stuck out seven over five solid innings and Demi Orimoloye went 2-for-4 with a run as the host Carolina Mudcats defeated the Down East Wood Ducks 3-2 in the opener of a four-game series at Five County Stadium on Monday night in a Class A Carolina League baseball showdown. Taugner (2-1, 5.03) led Carolina (61-70, 27-34) to the series-opening win after limiting the visiting Wood Ducks (58-75, 23-40) to just one unearned run on five hits over five innings pitched. ALL ABOUT ELEVATION. 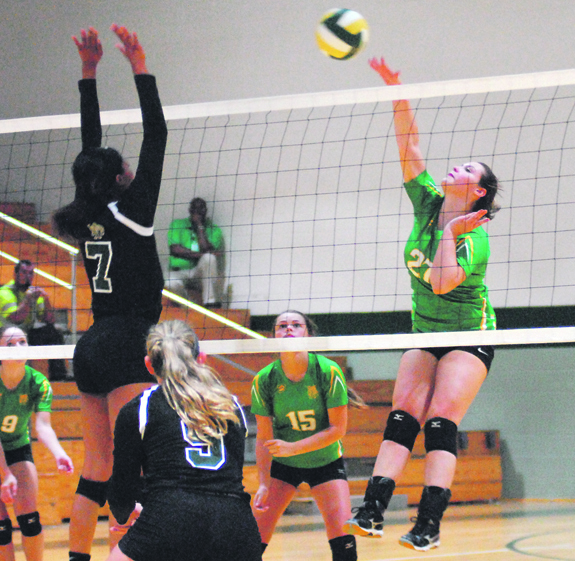 Bunn's Taylor Whitley (right) soars for a kill during last Wednesday's win over Northern Nash. BUNN -- The long-time volleyball rivalry between Bunn and Northern Nash has a different look these days. Legendary Bunn skipper Henry Jones retired before the 2017 season, and he was followed this fall by NN's Patricia Haggerty, who stepped down after two decades in charge of the Lady Knights' program. 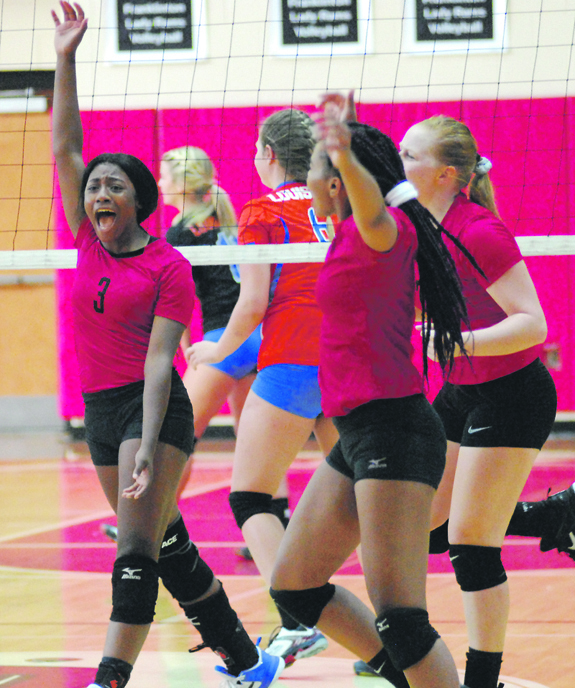 Amari Champion (left) and her Franklinton High School spike teammates celebrate after a kill during Thursday's match against the Louisburg Lady Warriors at the FHS Gymnasium. 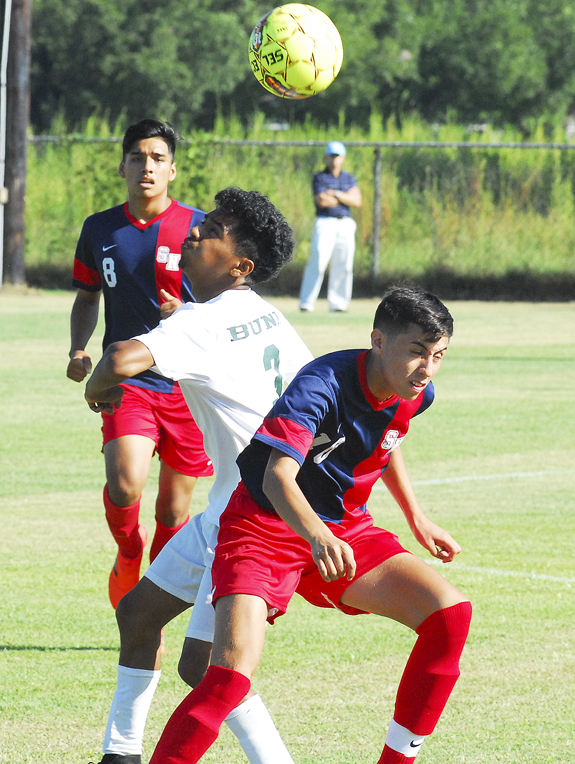 Bunn High School soccer player Elmer Garcia (left) tries to find some dribbling space during his club's road contest last Thursday afternoon against rival Southern Nash. 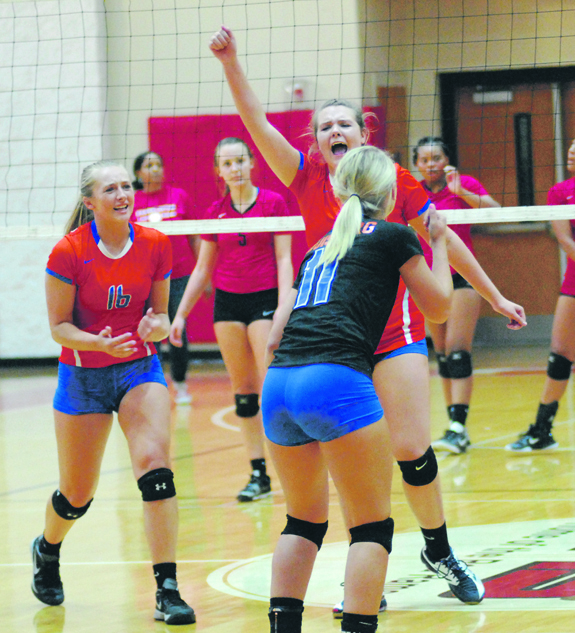 Louisburg's Dana Potter (arm raised) reacts after the Lady Warriors claim a key point on Tuesday. 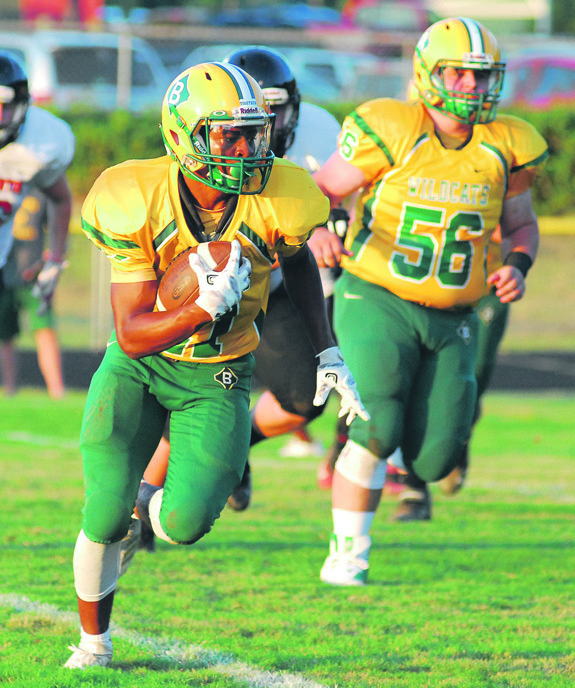 Bunn's Quentin Perry (with ball) scores off the right side for the Wildcats during last Friday night's home loss to backyard rival Franklinton at the BHS Football Field. 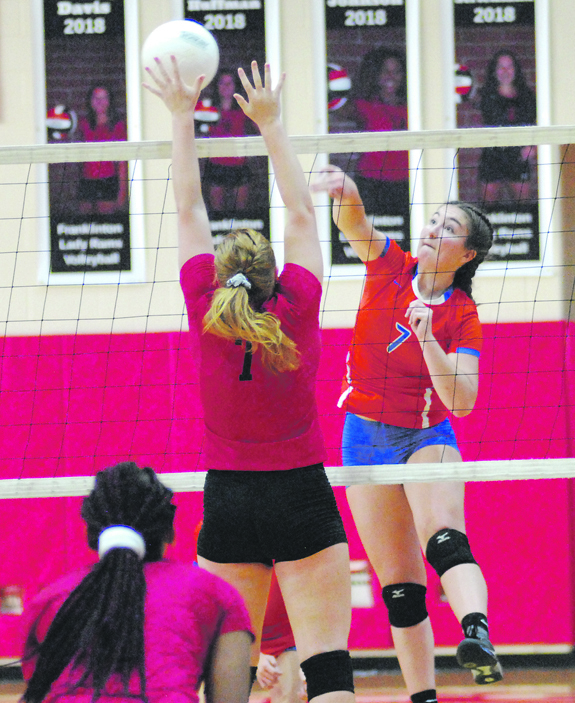 Louisburg High School's Kristen House (right) delivers a kill Tuesday evening against rival Franklinton. The Franklin County Student Arts Council program will be held the third Saturday of each month from noon to 2 p.m. at 118-B North Main Street in Louisburg. There is a $15 registration fee unless the student is parts of a family membership. The Franklin County Student Arts Council is a program for high school age students who wish to further their skills and knowledge in visual art. LOUISBURG -- In what can be described as a "night of future gazing," the Louisburg Town Council worked its way through a long agenda Monday night, much of it involving future or proposed projects. The meeting opened with a public hearing on a grant application to replace an aging water line along Bullock Drive in south Louisburg. As Franklin County Schools geared up for a new year that started this week, it became evident that a lot of children could use some help rounding up school supplies. Members of James A. Johnson Masonic Lodge 413 A.F. & A.M. of Louisburg rounded up a couple of their friends, Verizon and Allen Tate Real Estate, and together they managed to present 50 backpacks filled with school supplies to two local elementary schools. 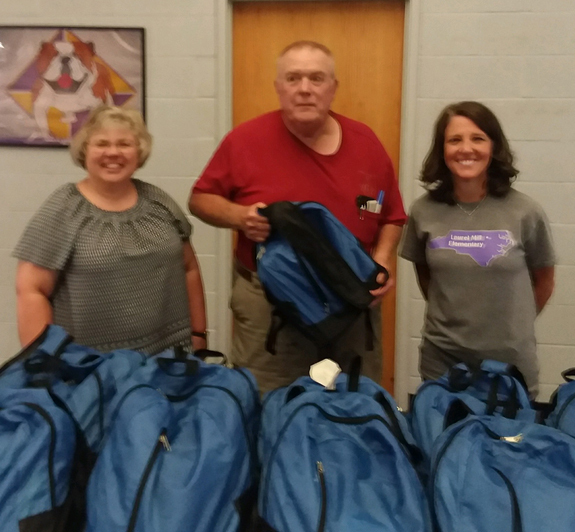 In the photo above, Lodge Master Al Langley presents backpacks to (at left) Rhonda Tharrington, guidance counselor at Laurel Mill Elementary School, and Genie Faulkner, the school's principal. 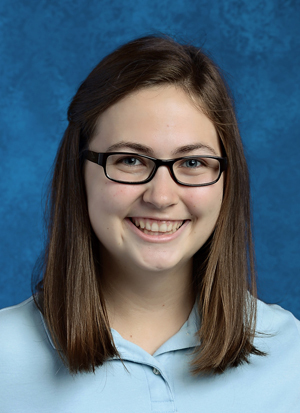 RALEIGH -- A Wake Forest Girl Scout earned an award for creating a STEM workshop for local girls that included engineers from around the area, including Franklinton and Youngsville. Girl Scouts - North Carolina Coastal Pines presented Megan Rogers with its Gold Award -- the highest achievement in Girl Scouts -- for arranging the workshop that included women engineers from Novozymes, EPA, Optum, IBM and Skanska. CASTALIA -- Soon, agricultural scientists will work with engineers, mathematicians, social scientists, computer scientists, modelers, economists and marketers in an attempt to make Raleigh the hub for plant sciences innovation. The hope is that Franklin County, particularly its still rural, agricultural parts, will be significant spokes as a result. YOUNGSVILLE -- Commissioners agreed that they would bring in a Chapel Hill headhunter to determine if they're the best option to find them a new town administrator. Commissioners also discussed if it might be time to convert the town's management style. LOUISBURG -- Franklin County sheriff's deputies and Bunn police arrested two Vance County men accused of breaking into a church. Michael Dustin Ellis, 27, and Colton Tyler Bullock, 29, both of Henderson, were charged with two counts of felony breaking and entering, one count of larceny after breaking and entering and one count of attempted larceny.